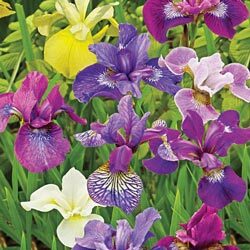 After the German iris has gone, but before the ensata iris bloom, that's when this Siberian mix takes the stage with its blend of blue, purple, white and yellow flowers. Graceful and bright, this colorful assortment delivers a dash of beauty and style to naturalized areas and cutting gardens. 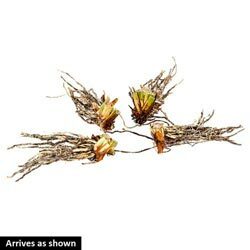 Easy to grow, it neatly fills the space between early-spring and late-summer bloomers. Germination Plant rhizomes just below soil surface and mulch shallowly in spring. Foliage Type: Slightly arching, narrow linear foliage 1/2 to 3-4" wide, ribbed and thickened along midrib. 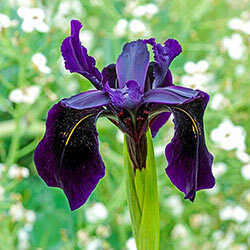 Flower Form: Like Dutch Bulbous Iris - slender 3' stems bear 2-5 delicate flowers per terminal head. Standards are narrow, spoon-shaped and erect. Style arms are conspicuous and falls hang down. Planting Instructions: Plant 2-3" below soil line. Water deeply during dry spells. Soil Requirements: Rich moist soil but will tolerate dry. Pruning: Let foliage die back naturally before removing. This ensures strong blooms for the next season. Additional Information: All Siberian iris bloom after German Iris and before summer blooming ensata. Easy to grow.